I finished my countertop today! I am so pleased with how it came out and I can't wait to do the rest of my kitchen after we finish painting the walls! It was so incredibly easy and can be done by anyone able to use a can of spray paint! First and foremost, you'll have to excuse the lousy pictures. I was carrying enough back and forth to the house and started this project on a whim, so cell phone pictures are all I have to document the process. 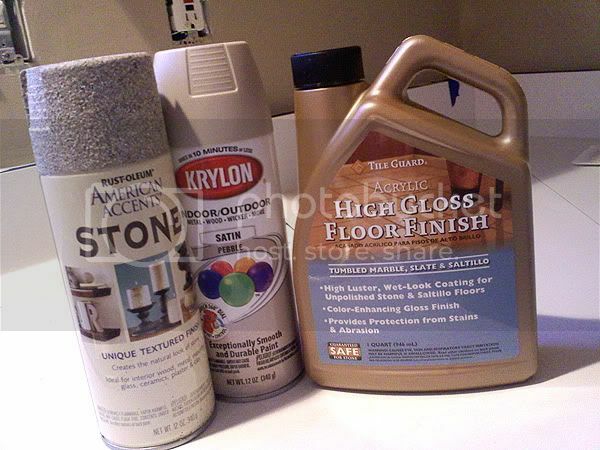 Now I had been looking for ways to replace or refinish laminate countertops since house #1. 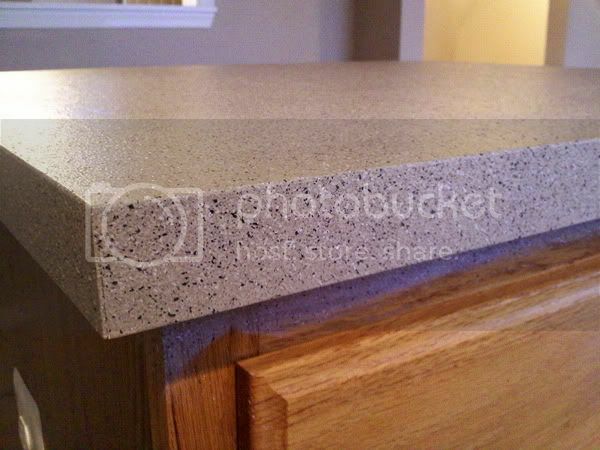 I was really happy to stumble on a webpage where people had created a faux granite look by sponge painting and thought, I could do that! So, during one of my trips to Walmart for paint supplies for the house I happened to venture down the spray paint isle and went to town. I basically made this up as I went along, drawing from my artistic nature and research in other areas of home remodeling. I cleaned the countertop really well to remove any existing stains and dirt. It hadn't been left in the best condition, so this was a definite necessity in my case. Then, taking a medium grit sandpaper, I ran it over the top and sides of the countertop to rough up the surface so my paint would have a texture to stick to. I also added a plastic drop cloth around my cabinets. You'll notice in later pictures that my paint ended up on the cabinet. I was fairly liberal with my drop cloth as I am painting this cabinet black and adding beadboard to the sides. If you don't intend to paint your cabinets as I don't with my main cabinets, make sure to take extra care to cover your cabinets, sink, walls, etc. I chose a tan base color and applied one coat. Depending on the stone finish you select, you could draw from any of the colors in the finish. I waited for it to dry and added a second coat after lighting sanding the surface of the counter again. You'll notice the coverage is spotty in some areas - that's okay though, as it adds to a more "natural" stone look. Then it was time to let the fun begin! Using a tan, white and black stone spray paint I covered the surface of my countertop evenly along with the edges and sides. 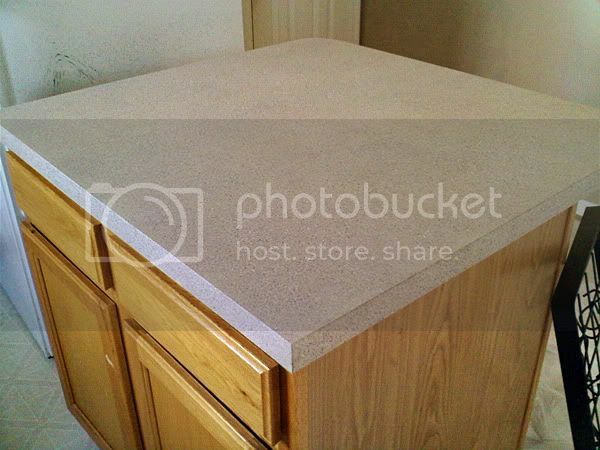 Already with just one coat it looked a million times better than my boring white countertops! After I allowed it to dry, I added a second coat until I reached my desired look. Depending on how thick you coat and the number of coats you apply determines the stone effect. I found a good balance with my second coat. Sorry for the horrible picture of it below. To prepare the countertop for the top coat, I again sanded the surface and edges with a fine grit sandpaper. This eliminated the rough edges of the stone effect and softened the texture. Depending on just how much you sand you can eliminate the texture, but I preferred a slightly raised surface and left it as so. There are a number of top coats you can use. I did a lot of research and decided on the best one for the look I was trying to achieve. I purchased a natural stone gloss finish treatment at Lowes. It is not recommended for food preparation areas, but very rarely do I cook and prepare food directly on my countertop. Enough threats from my mom about scraping her counters taught me young to place everything on a plate or cutting board. If this was safe enough to use on the floor and we abide by the 5 second rule when handling food, I felt just fine using it. If I die in a few months after moving in, you can say "I told you so". Other top coats that may be used are polyurithaine (I've read that it can tint the finish, so I stayed away from it and could only find poly for wood) and a thick epoxy called Envirotex. 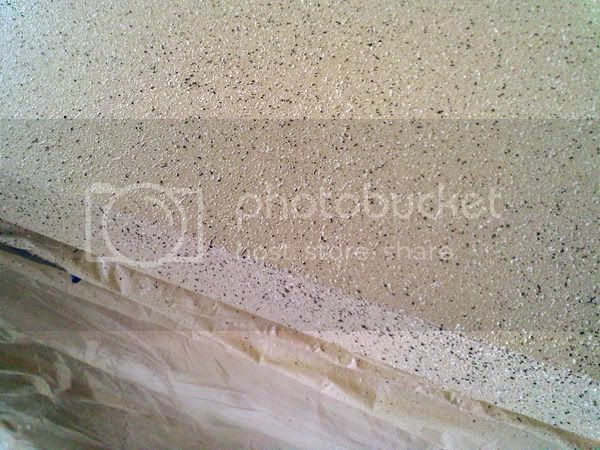 I've previously used envirotex and while I love the thick, shiny finish, I didn't want the headache of trying to get it to level out over the larger section of my countertop or deal with the possible bubbles that can occur (again, I'd read this was an issue). The envirotex method can only be poured and I was in the market for something I could apply with a roller. Code for fool proof. And tada, here is my after shot! 3 coats of top coat later, they're finished and they look beautiful! 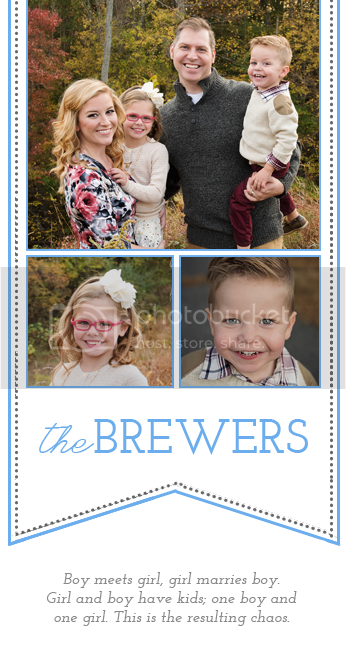 I am so pleased with the results! If you have any questions, feel free to ask! Stay tuned - my next project is to paint the island black, add beadboard and hardware! 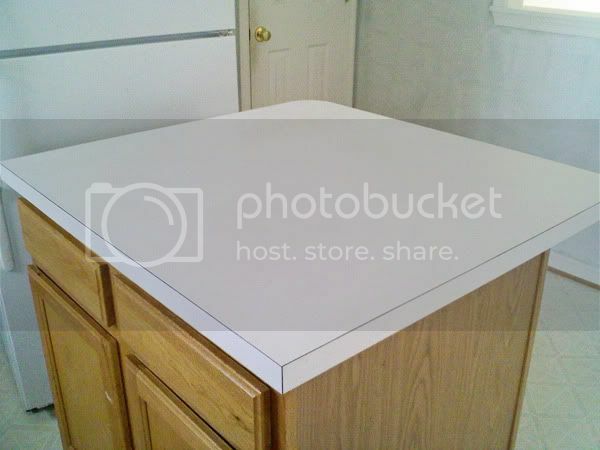 UPDATE (January 20, 2011): So I'm sure many of you still flocking to this post are curious how the counter tops have held up. I'm happy to say AWESOME! I am still so happy that I did this. I have had one issue that I learned from. Shortly after moving in, I set a glass pot lid that had been used to cover boiling potatoes on my countertop. The hot steam/suction soaked the countertop. I wiped it with a paper towel - big mistake. That amount of heat had pretty much made the treatment "fresh" and it smeared and started coming off. I've since learned anytime water puddles on the countertop for extended periods of time to DAB it and leave it. Once it dries, the countertop is as good as new. As for regular day to day, it cleans up great. I wipe it with my wet rag, clean it with cleaning products and have no issues getting old drops of pancake batter, speghetti sauce, etc. off it. UPDATE (March 3, 2013): I love how many people still find this post because of Pinterest! Again, I am still so in love with my counter tops and highly recommend this to anyone who doesn't have the money to afford the "good stuff" or who want to avoid the hassle of replacing the existing counter tops. I fell into both those categories. Still do. After three years in our house, I did touch up the counter top top coat. I wanted a little more sheen. This time, I used Minwax Top coat, water based, in Clear Gloss. If I went back and did it all over again, I would have just used this. Cheaper and I'm about the shine. The finish is up to you! That's awesome! I can't wait to see how the rest of your house turns out. You've got skill and lots of great ideas! I am excited to see the finished project! This is so great! We had white countertops in our condo, and we HATED them! I know we could have prob done this, I wish we would have. Good job! That looks AWESOME! I'm curious with how it will hold up though. I can't wait to see it all finished. You are now officially my decorating hero. I never would've been brave enough to try that on my countertops, but they look great! So impressed! That turned out so GREAT!! Good for you girlie! Thank you for posting such specific directions! I know how I'm going to fix my countertops now! wow - that's AWESOME! 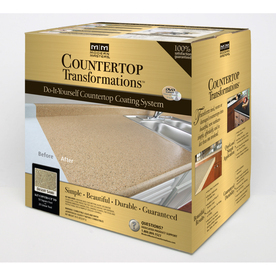 I saw the countertop transformer at Lowes on Monday night and was totally hooked...but not on the price tag! thanks for the awesome step-by-step instructions so I can make it myself!! WOW, it looks great! And the price tag...even better! Don't you just love the sense of accomplishment you feel...knowing you improved something all by yourself! Absolutely great job! I love that you researched all the products, as information makes for the best choices (coming from a retired painting contractor. I randomly stumbled across your blog. The previous owners used the countertop transformation kit in our kitchen. 18 months later it is starting to chip pretty badly, but hopfully it will hold up long enough for us to save up for some granite. Your way is cheaper and it will be easy to touch up in case it does start to chip. That looks amazing - you must be so proud! Thank you for sharing this! We are thinking about buying an older home with a tacky kitchen, and this will be a nice addition to my diy arsenal. Thank you so much for inspiring me! There are so many times I think of things and don't try them because they are not the "WAY" you are suppose to do it. I don't go with my gut and have faith in my own creativity but you have definitely inspired me to go for it and to have faith in my ideas! We did this in on all our kitchen counters and over all it turned out well!! We first tried sealing it with oil based poly and yes it does tint your counters so we resanded and used regular waterbased poly and they look great!! Great job! Where there's a will there's a way! I LOVE this post and LOVE your blog!!! You are so brave for trying this and thank you for giving me a great idea for my white countertops!!!!!!!!!!!!!!!! I am adding this post to my Inspire My Saturday post today. Come on over and check it out if you get a chance. This is incredible!!! We just bought a house and I dont like the countertops. we dont have the money to replace them right now. I am going try this out! What an awesome job you did on your countertops! I'm always looking for frugal ways to fix up my home and this is definatly one I want to remember. Thanks for the post! Wow! That is impressive. I lived with horrible counter tops like that for so long.. if only i'd known. Great job! looks great! thanks for sharing! I'm so glad it turned out so pretty for you! I love it! You did a wonderful job. It looks great. Can't wait to see how it will look when you finish with the black paint and bead board!!!! Looks great!! I hopped over here from 320 sycamore... after speding the weekend shopping for a kitchen remodel, I think I might give this a try! Thanks for the directions. This is an awesome solution! Thanks for sharing...I will definitely be trying this. I am so impressed! It's beautiful and SO innovative! Can't wait to see what you do with the rest of the house. this is amazing! excellent job! it makes me want to try this out right this second. :) we have an upstairs (kids) bathroom that i think we'll do this too. thanks!!! Thanks for sharing this. I love it. I have yucky countertops and have contemplated painting. thanks for the how-to! Thanks for all the feedback everyone! I can't wait to finish the island off with some beadboard wallpaper and black paint! I'll be sure to catalog the how to again and keep you updated on the rest of my projects! I found your post at just the right time! I think I came over from 320 Sycamore. I have just had a piece of plywood temporarily installed, but a couple of misfortunes have made that temporary a little longer than I was anticipating (a year or more). I have sprayed the counters & am waiting for them to dry, but I have a question about the finish. How long did you wait for the paint to dry before you applied the finish & why the floor finish over others? I would follow whatever directions your paint gives you to be safe. I waited about an hour between each base coat and then about 10 minutes between each texture coat, as directed by the can I believe. I ended up letting everything set for a day or two while I picked out the finish, but I probably would have continued the process that day if I'd had the product available. I did a lot of research on the top coat and went with the floor finish because I knew it would stain clear and would be consistent with what you would seal a natural stone with. If you decide to use a polyurithaine, use a water based one vs. an oil based. I read that oil based can "tint" the finish a warmer color. Also, Envirotex is GREAT for a thick, high gloss finish, but also prone to bubbles (which must be sanded and completely redone to correct) and didn't want to try and level it out (you can't use a brush or tools) over my entire large portion of countertop I have yet to do. good luck! Let me know how it works out! great job. looks awesome and with so little invested money wise! So I have been saving this in my favorites under AAAAA Great countertop re-do, lol. Anyway you could email me: nreyn1@amfam.com & tell me how you still like them? I really really REALLY want to do this but am sooooo afraid to. I really need some encouragement, lol. Thanks & only if you get a chance. I have wanted to do this for years and I also just found that product at Lowe's and thought there has to be a better way. How is this holding up? Hey that's a lovely granite countertop. I found your blog on pinterest. I have been thinking about replacing my counter tops for a few years now, but couldn't bring myself to spend the money. I can't thank you enough for this idea. I just finished doing this to my counters and I am in love! Thank you again! 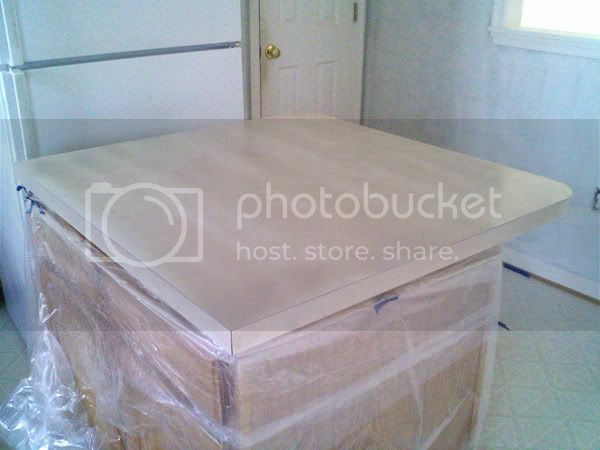 Rustoleum now has a counter top coating (the top coat/finish)specially made for just this type of project. I'm going to be doing mine this weekend using that as my top coat. Hope it works! Thanks for adding this information. How do you like the finished results? are you having any issues with using the counter tops in the kitchen and water spots or marks that others have reported with the recommended finish? I am so excited to get this done in my kitchen!!! Thanks for this wonderful post...I am on my way to get the paint to do this today...my counter tops are hideous and backsplash...those will be next on my list after the counter tops! Very nice! 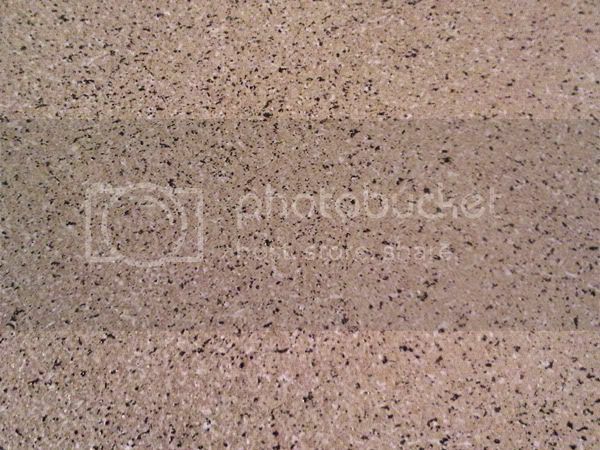 I'd like to do this to my countertops in the bathrooms too but they are cultured marble tops. Do you know this will work on that type of surface? Used this technique on my countertops and they turned out GREAT! The only thing I did different was primed before the spray paint only because I was covering a ugly fake butcher block countertop and I didn't want it to show through. Was interested to know what color the stone spray paint was that you used? This is exactly what I need for my new apartment! Great for broke college kids! I found this on Pinterest and I am in love! We will be buying our first home shortly and I can not wait to do this to all the counter tops. If i use a darker spray paint for the base (gray) will the stone look darker? I am doing this next weekend. Just want to be sure that I can do this process on a ceramic countertop as well? Karen, did you end up doing this on a ceramic countertop? What did you do about the ridges made by grout lines - did you apply anything to fill them in a make them level with the tile? Found this on Pinterest and we did our kitchen counters a week ago. I LOVE them - much better than the faux dark green marble laminate, and much cheaper than replacing entirely! I took your advice and used the Minwax high gloss for the topcoat - did three coats. I know it has only been a week and maybe it takes longer for them to fully cure, but will it always get milky white spots from water or does that go away with time? I use cutting boards and am very careful, but it is a kitchen after all and water is inevitable. I find that even a small drop on the counter for 10 minutes makes a white spot and starts to go soft. Hoping it will cure/harden over time? Still better than faux green marble though :) Thanks for sharing! Lindsay, did you find that this product hardened over time? Would you recommend this for a kitchen table? It's laminate just like my counters and was thinking if I liked it for my table I would do my counters as well. This is what I did and it turned out great. I mixed Durham's water putty to medium consistency then spread a even coat over my countertop. like real stone, people can't believe how I did this I love it, just had to share. 2016 and still finding your posts. Gonna do this as soon as husband goes with friends for a weeklong trip. Still holding up fairly well? I am going to try this in a few weeks, I will write a blog post and tag you in it after it is compleate. Thanks for all the updates! I don't usually comment on posts, BUT, I had to. This project is AMAZING! And I so appreciate the feedback updates. I would have ruined them for sure with the hot lid/ steam thing. I am so excited. I'm saving this on Pinterest and am going to post a link from my own blog once I do this to my counters!!! Yeah. THANK YOU, THANK YOU, THANK YOU! At first, I did not believe that it was just paint because it looks super real. I need to try this on my counter tops ASAP. We have the ugly white laminate counter tops too and I am over them! I didn’t realize that brewery floor coating can go this amazing! The counter tops you have finished today have motivated my laziness to the fullest and have aroused the zeal of doing something better with my counterparts too. Keep sharing these amazing posts. Question, did you follow the exact instruction including Poly coat too? I am tempted to do it because i have tan countertop and I hate it.. I'm currently doing this on my counter tops but ran into problems after I sanded the stone accent finish after it dried then attempted to use a damp cloth for wiping up the dust. This became a big mess because the stone accent finish started smearing and rubbing off. So I had to sand this section back down to the counter top and start all over. Then before I painted on the polycrylic top coat, I sprayed everything with a protective clear sealant to have it set prior to using the brush on it and potentially smearing it again. This did the trick.